The M-Audio® Axiom® Pro 49 keyboard controller builds on the acclaimed Axiom 49 with premium TruTouch™ action, proprietary HyperControl™ MIDI mapping technology and other cutting-edge enhancements. HyperControl automatically maps the keyboard's 65 controls to commonly accessed parameters in digital audio workstations including Pro Tools®, Cubase, Logic and Reason*, as well as software instruments. The constant two-way link with your host DAW means the keyboard's controls are always in sync with your software's active parameters. The intuitive graphic LCD constantly updates the current values, which ensures seamless editing and prevents parameter jumps—even when plug-ins are closed. Toggle instantly between Mixer and Instrument control modes. Map buttons to send QWERTY key commands right from the Axiom Pro 49. Save settings to 50 memory locations—each with four profiles of quick recall via the intuitive graphic LCD. Now you can control your entire session right from your Axiom Pro 49. Thanks to revolutionary M-Audio HyperControl technology, your Axiom Pro 49 controller will automatically map to commonly used parameters of popular software instruments and digital audio workstations including Pro Tools, Cubase, Logic and Reason* systems. HyperControl updates the virtual instrument or track parameter mappings of each control in real time as you sequence—it doesn’t get any easier. 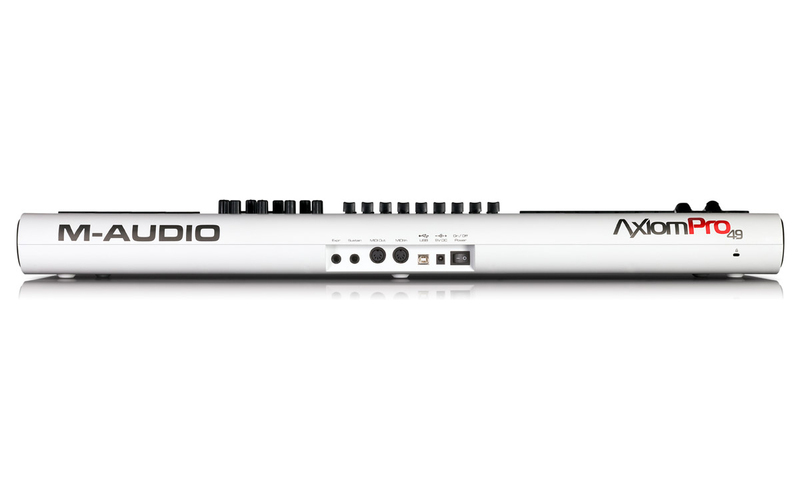 While other controllers offer mapping, only the M-Audio Axiom Pro line has HyperControl technology. HyperControl synchronizes Axiom Pro with your DAW, ensuring that your hardware and software collaborate to form a single work environment. The technology utilizes the Axiom Pro 49 graphic LCD to group software controls together in a modular fashion. Similar controls are organized in named groups and accessed via four dedicated softkeys, which are continually updated to reflect the mapped parameters. A dedicated button toggles between Mixer and Instrument modes for instant hands-on control of all of your software’s functionality. Dedicated Track buttons allow sequential navigation of your mixer and instantaneous mapping of software instruments within the selected track. You can even control software instruments without opening them. The six dedicated transport buttons on the Axiom Pro 49 controller give you immediate hands-on access to all of your host DAW’s playback and recording controls. Unlike other all-or-nothing systems, Axiom Pro 49 also features a transport-only mode. This option lets you access DAW transports and track navigation via HyperControl technology, while creating and controlling your own custom MIDI assignments for the trigger pads, buttons, sliders and encoders. With great feel in a lightweight chassis, the Axiom Pro 49 controller provides a new level of creative inspiration. The M-Audio TruTouch™ keybed combines professional semi-weighted action with advanced high-speed keybed scanning technology for an ultra-expressive playing experience. Assignable aftertouch adds an extra measure of expression and control. 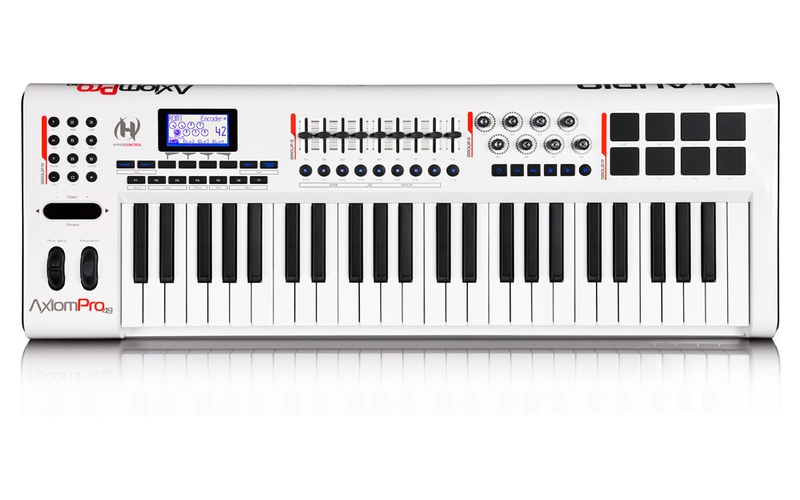 The Axiom Pro keyboard controller line is the first to combine MIDI control with ASCII keystrokes. You can assign any button on Axiom Pro 49 to send ASCII messages accessing any of the available QWERTY keyboard shortcuts within your host DAW. Imagine the possibilities with Copy, Paste, Duplicate, New Track—anything you want to assign. Axiom Pro 49 has an amazing 65 MIDI-assignable controls, putting complete session control in one place. The eight velocity-sensitive trigger pads integrate acclaimed M-Audio Trigger Finger technology for laying down rhythm tracks or triggering loops and samples. Smoothly control parameters like filters, EQ and panning with the eight rotary encoder knobs. The nine 40mm sliders (each with its own fully assignable button) feature auto-mute to prevent jumping—ideal for controlling mixes, virtual organ drawbars and more. The keyboard’s extensive controllers also include 12 fully assignable buttons in the keypad arrangement, a data/octave button, pitch bend and mod wheels, aftertouch, and dual assignable pedal jacks. In addition to USB connectivity, you’ll also find traditional MIDI In and MIDI Out ports for connecting external MIDI devices. 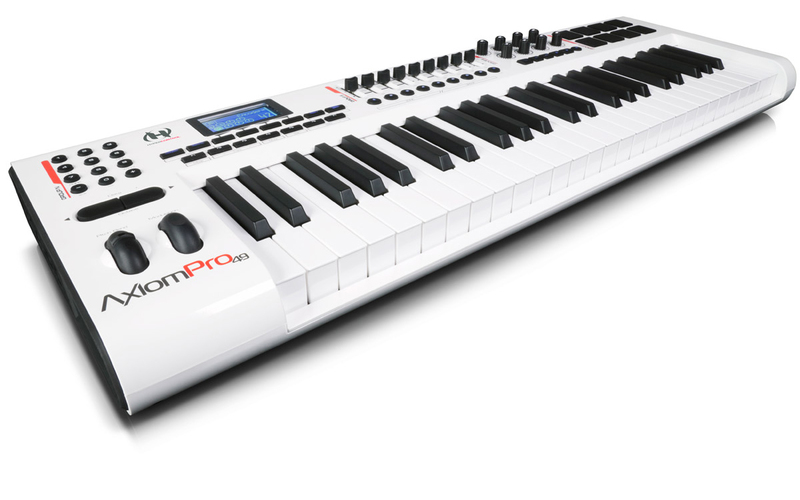 The Axiom Pro 49 keyboard has 50 memory locations—each with four quick-access profiles of controller assignments—allowing you to easily create and manage your own extensive library of presets with unprecedented power, ease and flexibility.